After closing its doors for the 13th edition, Automechanika Shanghai has recorded its most successful ever year. The 2017 show, which took place from 29 November to 2 December, has received overwhelmingly positive response from all corners of the automotive industry. The event represents the entire supply chain for business exchange, marketing, networking and education on a global scale, and is Asia’s largest trade fair for the automotive parts, accessories and service industries. With encouraging final figures and participant feedback, the show continues its upward trajectory in terms of scale and overall offerings. The success and growth of the fair was clear to see on the show floor, particularly through a number of new and enhanced areas on display. For example, show participants noted how there was a stronger emphasis on electronics at the show, with an increased display of new energy vehicles, electric car developments, and autonomous driving innovations. Participants also emphasised how this reflects the overall direction in which the entire automotive industry is moving in, and many praised the show’s ability to run in tandem with the evolving trends of automotive industry. On top of this, with the addition of the brand new REIFEN Zone for tyres, wheels and rims, the industry’s entire product supply chain is now covered at Automechanika Shanghai. Many exhibitors expressed how this helps generate more opportunities for cross-sector collaboration with leading players for parts, components, repair, maintenance, accessories, customising, electronics, systems, and tyres. The same can be said for the increased internationalism of the fair, with 19 individual country and region pavilions participating from France, Germany, Hong Kong, Indonesia, Italy, Japan, Korea, Malaysia, Pakistan, Poland, Russia, Singapore, Spain, Taiwan, Thailand, Turkey, the UK, the US and the UAE. There has also been a 14% increase in overseas exhibitors compared to last year. These boosts have led to what has become Automechanika Shanghai’s largest ever globally represented show, transforming the fair into an international hub by drawing in high-level participants from multiple sectors. These participants include a number of new players this year, such as ADAYO, AUTOYONG, Carzone, ENEOS, Fangxing Tyre, Fleetguard, FUCHS, Gazele 3, Henkel, Isuzu, Linglong, MTA and Tyreplus, as well as many returning brands exhibiting at the show once again, including ACDelco, BILSTEIN, Bosch, Brembo, Continental Automotive, Dana, Delphi, Denso, Dongfeng, FAWER, Hitachi, Interstate Batteries, LIQUI MOLY, Magneti Marelli, Mobiletron, Motul, NTN-SNR, RAV, Rotary, SATA, Schaeffler, Snap-on, SONAX, Valvoline, ZF, and more. What’s more, the show’s exhibitors crossed paths with a record number of 130,928 visitors from 142 countries and regions this year, 26% of which came from overseas. The top 10 visiting countries for the 2017 edition included Taiwan, Korea, Russia, Malaysia, Iran, India, Thailand, Japan, Turkey and Australia. Even more positive feedback came from Automechanika Shanghai’s range of concurrent fringe events. Amongst these were the highly anticipated Connected Mobility Conference, as well as the AIAG Auto Parts Purchasing Leadership and Suppliers Summit, and the 3rd Summit for Merger and Acquisition Strategies for Chinese Automotive Corporations in the Overseas Markets. Many of the fringe programme’s attendees expressed how each of the events served as a vital source to learn, interact and to expand their business across Asia’s entire automotive industry, and also praised the expanded topic coverage. Saint Gobain are headqartered in France, and we supply high performance polymer products for bearings, seals, battery packs for electric vehicles, thermal management and paint protection. 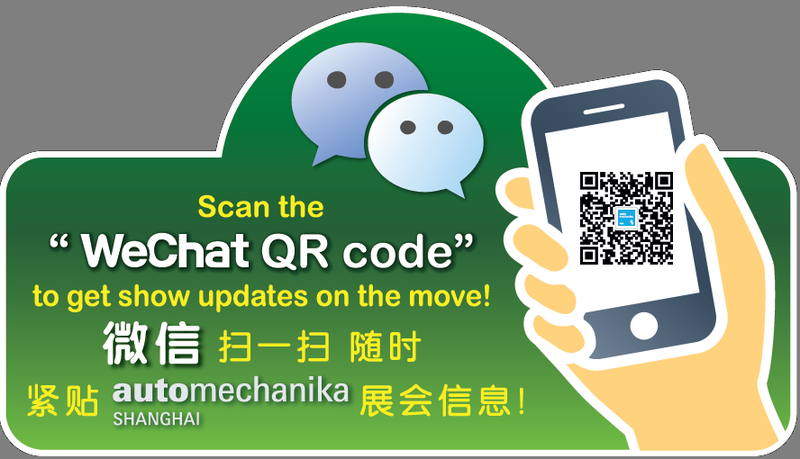 From an exhibitor’s point of view, we have noticed that Automechanika Shanghai’s visitors are actively looking for more and more sophisticated and electronically advanced products at this year’s show. Visitors to our booth have particularly been interested in our applications for electric vehicles, which I think speaks for the shift in the Chinese market trends. We think the fair is heading in a positive direction, and it is most certainly in line with the industry both domestically, and globally too. As a subsidiary for leading US company Wai Global, it seems the automotive industry in China is rapidly developing in line with the rise of annual vehicle sales, and car owners are paying closer attention to quality, comfort, and more high-end products. I believe we’re now in the ‘golden age’ of development for car maintenance, electronics, repair, spare parts and many other sectors. In my opinion, Automechanika Shanghai helps bring all of these sector developments together. Many of our biggest clients are scattered all over the world. By exhibiting at this show, we have the chance to work alongside each one of them, whilst at the same time significantly expanding our business in China. Our company provides railway traction converter products, but we also work on the research and development of new energy vehicle drive system products, which is a very hot topic at Automechanika Shanghai this year. New energy vehicles are still very young in terms of their market penetration both in China and globally, but thanks to the sector’s growing representation at Automechanika Shanghai, we expect more and more people will devote themselves to this field in the coming years. The number of visitors and the scale of the fair is very big, and there is also a particularly strong focus on the parts and components sector, which demonstrates the show’s impressive all-round coverage. This year, we presented our latest remanufactured spark plugs and sensor products. Automechanika Shanghai is a global influential trade fair for the automotive parts and aftermarket. Through the show, we want to introduce our brand to visitors, as well as let more people know about auto parts remanufacturing. We have more buyers coming to our booth compared to last year and we are very satisfied with the arrangements from the organiser. Our products provide vehicle owners and repair workshops with diagnostic reports to get the status of each electronic control system. At this year’s show, we introduced a new range of artificial intelligence products, meaning car owners can directly understand the status of the car without relying on professional technicians. I think the automotive industry is always the frontrunner for technological developments. It is continually developing more advanced products and systems, especially in terms of autopilot cars and connected mobility. Automechanika Shanghai is a good reflection of this. Our headquarters are based in Germany, and our main business is automotive lubricants, additives, and car care products. We chose to exhibit at Automechanika Shanghai because not only is it part of the huge Automechanika brand, but it is the top professional automotive exhibition in China. For us, the event is the most ideal opportunity to release our new products to the Chinese market. We have been very satisfied with the visitor flow at the show each day. The customers who come to the booth are mostly domestic dealers, all of whom have very strong intentions to place multiple orders. We are very pleased to have the opportunity to participate in the first ever REIFEN Zone at Automechanika Shanghai. We feel optimistic about the future potential of this dedicated area, because it really helps link up key players from the tyre sector with the entire automotive industry. Exhibiting here has allowed us to meet many overseas professional trade visitors and I am certain we will come back next year. We are the Spanish Automotive Suppliers Association, and have been exhibiting at Automechanika Shanghai for several editions now. For us, this show is one of the most important fairs to attend in the world because it helps us directly reach the local Chinese market, and also means we can tap into its strong influence across Asia. The number of visitors keeps improving, but the quality of the visitors is getting higher and higher too. One thing that has surprised me is the number of international visitors, including those from as far away as South America. We are a wholesaler and distributor of automotive service equipment. The show is extremely useful for us, because we are able to find all kinds of spare parts developments here. I am interested in the impressive range of testing equipment and tyre changers on display. I particularly like the new REIFEN Zone too, since segmentation is very useful in helping customers to find what they want in such a big exhibition. I attended the Application of Advanced Composite Materials in New Energy Vehicles Summit because I am very interested in this particular topic. Advanced composite materials are key to the new developments of new energy vehicles. We want to keep up with the trends in order to grasp the opportunities during the evolution. The summit is very helpful and has made a lot of practical advice for me. Automechanika Shanghai seems to highlight the very latest trends of the industry, and also has a very rewarding schedule of fringe activities in terms of topic and speakers. One of the main trends we’ve noticed this year is cross-regional collaboration, both in the fringe programme and on the show floor. It is very important to further strengthen the upstream and downstream aspects of the supply chain for our association members, and we think that participating in a global show like this really allows them to do that. The next edition of Automechanika Shanghai will take place from 28 November – 1 December 2018. For more information about the show, please contact Messe Frankfurt (HK) Ltd on +852 2802 7728 or auto@hongkong.messefrankfurt.com.